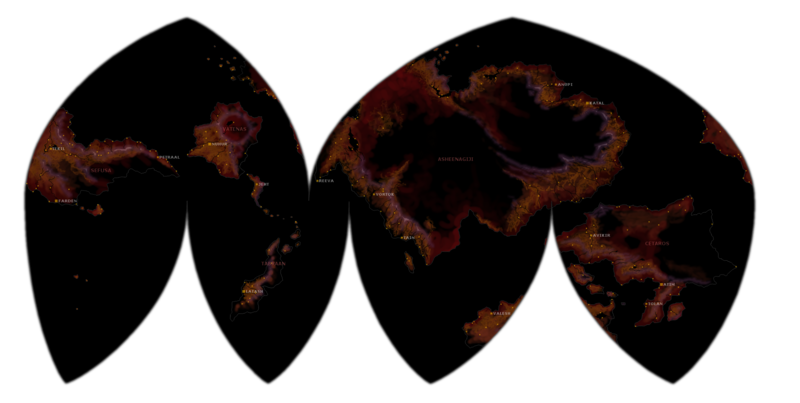 The world Tarnish plays on, Nekenalos, is a world much like Earth, but with 65 million years of divergent evolution. It houses two sapient species - the dominant Nayabaru (diurnal, bipedal, smooth-skinned descendants of iguanodonts) and the near-extinct kavkema (nocturnal descendants of Cretaceous 'raptors) that they are at odds with. Until recently, it was housed in the Upsilon Andromedae system. Most of the inhabitants don't know why or through what forces the planet was moved - some don't know that it has been, withdrawn into mythological interpretations of the sky. One such mythology is the kavkem mythology Nitish Ynas, loosely translating to The Tarnish. The adherents of Tarnish believe that direct sunlight literally corrupts your soul - it's their forgiving explanation for why the Nayabaru are so unspeakably cruel to their kind. Unfortunately, it also demands a place in the shade for them at all times. It is the year 2060. Nekenalos is now in a steady orbit around Sol. Humans have sent flybys to the planet, learning enough to know it is definitely inhabited by sapients. As a curious species, they've sent a manned mission to the planet to try to establish contact. The capsule, equipped with all the right quarantine procedures necessary to investigate a planet with 65 million years of divergent microbial evolution, lands near the mountain range between the twin deserts of Asheenagiji, setting down near the edge of Sinukaaj. The Tarnish kavkema and the Nayabaru in the vicinity are the first to notice. Driven by a desperate desire to protect whatever has fallen out of the sky from the sunlight, the Tarnish kavkema rush into an impromptu expedition to rescue the alien vessel. Initially, player characters should be kavkema of the Tarnish faith. As the story unfolds, other options will make themselves available, and NPCs may end up for adoption. Select players who are trusted to respect the characters or that know the setting well (e.g. readers of A Thread Between The Stars) may be allowed to play humans or Nayabaru from the start.